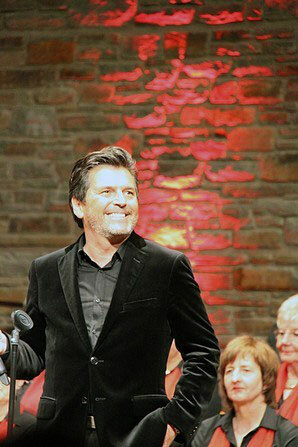 A Christmas in Vallendar brought the fans up above - Thomas Anders Online - Die offizielle Fanpage! For many people Christmas time means stress, hectic pace, appointment pressure and many things to do. A long long list to work on, between the first and fourth advent. Such a long list, that many People forget about the important things in this colorful and bright time. Christmas time is “feelgood time”. Twinkling lights in the houses, colorful Christmas markets, the smell of cinnamon, cloves, oranges and marzipan lies in the air. Christmas time is chumminess. Exchange little pleasantries with friends and family, use the time together. Think about cooperation in society, also with foreign people. Christmas time is music. Familiar sounds, like all the years before, droning out of the loud speakers while Christmas shopping, or first out of the radio while “Driving home for Christmas” and later on, under the “Oh Christmas tree”. “Silverbells in the air ringing in Christmas time”, happy children are all around singing “Let it snow”, because they are dreaming of a “White Christmas”. “It’s Christmas time, the angels sing, listen to the sleigh bells ring…” or “Oh babe it’s Christmas and I give you my heart…”. Anders”, a charity concert, half and half for the Child Protection Agency Coblence and for youth and children projects from the city of Vallendar. Thomas had lots of support from the “Choral Society Germania 1870 e.V.”, directed by Tristan Kusber and from his musicians. These are Achim Brochhausen on the keyboards, Wolfgang Ritter on the contrabass and the wonderful Tammy Sperlich as the background singer, Bruce on the drums and Sascha on the guitar. Around 700 people entered the auditorium happily, because outside temperatures were cold but dry. The color red was dominant on stage. Red candles, winter roses, a red decorated Christmas tree and the red scarves of the choir members. The rest was very plain, music was centered. On time, at 19:30 the choir began the charity concert with the German song “Weihnachten”. They sang six songs all over the whole show. 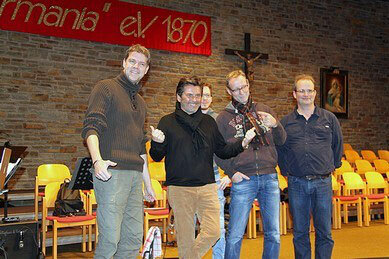 They sang the German song “Es ist ein Ros’ entsprungen” together with Thomas. Sounded very different! The last song, a wonderful ballad originally sung by Barry Manilow, is about Sylvester. Is the Sylvester night a special one? What is special about it? A wonderful finish of the concert. 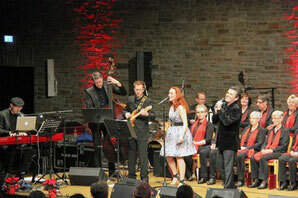 The audience was wowed and positively impressed by the central theme and the swinging mood. 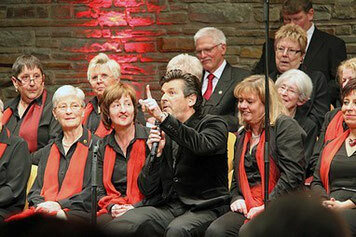 After the show, some acknowledgments were spoken by the leader of the Choral Society. He thanked the director Tristan Kusber, the none Sister Louise and Thomas Anders with flowers and some sweets, called “Süße Grüße aus Vallendar”. A big “Thank you” from me to Thomas, because of his annual, tireless support for the Child Protection Agency, his affair of the heart. Standing on stage, without any pay and with a completely full appointment book. Of course many thanks to the band and Tammy, they are always a great support and make the sound around Thomas. The technicians, they are always there and put the actors into the right light and make everything sound very well. Thank you for the time, the music and surely until next year, how do the Germans sing? “Alle Jahre wieder”! For the gallery move to German version!